Their most recent profile is of Darius Jones, a young Chicagoan and friend of FamilyFarmed, for whom the “hero” title is apt. A troubled youth that resulted in him being incarcerated also set him on the path to the cutting edge of urban agriculture in his hometown. 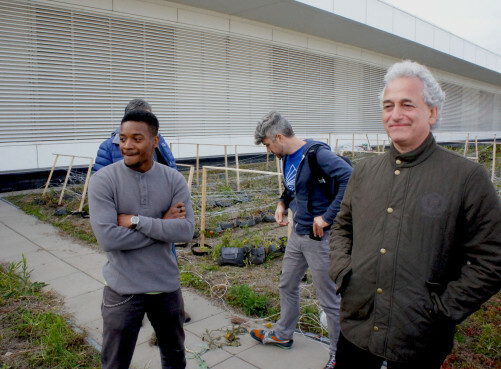 He participated in the training program of Windy City Harvest, operated by the Chicago Botanic Garden, then went to work at the rooftop farm that was being developed at McCormick Place, the nation’s biggest convention center. His achievements in his role as coordinator of that farm earned him a place on stage during the Farm Aid news conference Sept. 19, right behind the music legends who lead the organization. 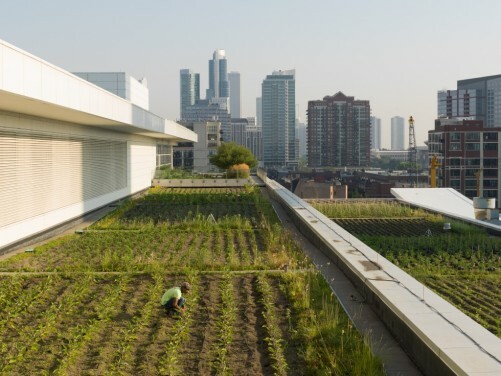 The rooftop installation is part of a major sustainability effort conducted by McCormick Place and Savor…Chicago, its foodservice provider. McCormick Place was one of several public facilities that announced plans, at FamilyFarmed’s 2014 Good Food Festival & Conference, to procure at least 15 percent of their food items from local producers. In the short time since, the convention center actually has increased its local procurement to more than 40 percent of all the food it purchases. Please enjoy — and share — this story about Darius Jones. On a hot, sunny late-July day, we meet Kevin Jezewski, a driving force for sustainability with SAVOR…Chicago at McCormick Place, the largest convention center in North America. A group of us are in Chicago to announce the Farm Aid concert and to do some farm visits. Kevin leads us into an elevator, across a skywalk, up a staircase, through back hallways, and finally we emerge onto a rooftop garden, five floors up. We step blinking onto the farm teeming with dragonflies, bursting with tomatoes, and being attended to by a number of interns led by the charismatic farmer Darius Jones, who we’re here to meet today. Darius is excited to see us, to shake our hands and tell us about this place that he so clearly loves. I’ve done my research, I know Darius’ background. That he was born and raised on Chicago’s West Side. That he ended up in Cook County Jail at the age of 17 with a 15-year sentence after pleading guilty to a felony. Darius Jones, the coordinator of the rooftop farm at Chicago’s McCormick Place convention center, had a troubled youth that he turned around by engaging in urban agriculture. Photo by Paul Natkin, courtesy of Farm Aid. He was enrolled in the Vocational Rehabilitation Impact Center’s garden program in 2010, and that’s when he caught the farming bug. It’s a captivating story, but meeting Darius, his history is not the focus. Instead, it’s the present and the bright future for this young, confident, passionate person who left one life behind to cultivate a better one. 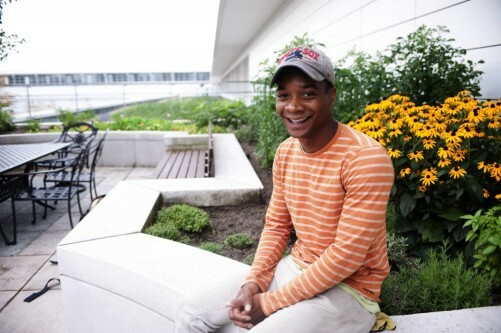 After his release, Darius enrolled in the nine-month Windy City Harvest Apprenticeship program and received his certificate in sustainable urban agriculture. He began working as the sales coordinator for Windy City Harvest, increasing sales of produce from their 11 urban farms by 100 percent for each of his two years in the role. Thanks to his passion for the produce and his knowledge about how it grows and tastes, he was promoted to the position of coordinator of the McCormick Place Rooftop Farm, which is a partnership between Windy City Harvest (a program of the Chicago Botanic Garden) and SAVOR…Chicago, the convention center’s food service provider. This expansive urban rooftop farm sits atop Chicago’s McCormick Place, the nation’s largest convention center. The site’s catering service also has greatly boosted its sourcing of food from local producers. Photo by Wittefini, courtesy of Farm Aid. To that end, he packs himself a lunch of bread and maybe a couple slices of pepperoni or cheese. Come lunchtime, he goes up and down the plant rows, harvesting perhaps some basil, a bit of Bibb lettuce, a hot pepper or two, and he slices up one of the juicy tomatoes hanging from his painstakingly staked tomato plants, savoring the flavor he has brought into being five floors off the ground. Darius Jones (left), coordinator of the rooftop farm at Chicago’s McCormick Place convention center, during a FamilyFarmed staff visit in October 2014. FamilyFarmed President Jim Slama is on the right. Photo by Bob Benenson/FamilyFarmed. Kevin explains that aside from what Darius eats, all the produce grown on the rooftop farm is used by SAVOR… Chicago for the catering and restaurants at McCormick Place. Kevin and Darius work together to determine what they’ll grow on the roof. Darius tracks his crops and does testing to find out what crops grow best, and what methods increase productivity. Darius keeps the laughter going as he begins the story of the Wapsipinicon Peach tomato, another learning experience. Lest anyone think that Darius has a posh job nibbling good food and kicking back to watch the urbanites run the rat race below, Darius tells us the difficulties of growing on the roof. To start with, when he started at the farm two years ago, he was afraid of heights! Today he bounds up a ladder to show me the best place to take a photo on the roof, while 20,000 bees buzz nearby. “Don’t be scared of the bees,” he instructs. “They’re busy, they don’t want to bother with you.” With his endless enthusiasm, Darius explains other things I don’t know about bees: “They’re very hygienic animals; they won’t poop in the hive. That wall behind you,” he says, pointing to a grey-streaked wall, “That’s where they poop.” They also need water. “It’s 80 degrees out here, right?” he says. “It’s 100 degrees in that hive, with all those little bodies buzzing around!” They have to keep hydrated, so Darius keeps a trough filled for them. Bending down to pick up a handful of “soil,” Darius shows us what his thriving crops grow in, which is not soil so much as slate amended with compost, organic seaweed fertilizer and fish waste. The slate is left over from its original purpose, which was to sustain sedum when the roof was originally intended to be a green roof, not one that produces 8,000 pounds of food a year. Growing in shale is tricky, and the weight capacity of the roof is a constant factor in terms of how much water and compost can be added to it to make it a suitable growing material for food, but Darius is making it work. It really retains the moisture, he explains, and in the fall, the roots of existing crops are left in the ground to hold the structure of the soil and fix nitrogen in it. Every soil amendment is carried by hand up to the roof—from the compost to the water. Each of the garden beds is on a two year crop rotation, and Darius does companion planting, knowing which plants grow well with each other. The farm uses no chemical inputs, so proper crop rotation and companion plantings are critical to the plants’ health. Meeting Darius, one wonders how this 23-year-old has come through so much as positive as he is. As he directs the interns working with him, it’s clear they look up to him. They respect his experience and knowledge, and he respects the challenges they, like he, may be working to overcome. Some, like him, come from backgrounds where they’re getting back on track. Others are pursuing a new career or increasing their gardening skills. They come from across the city, the country and the world to be part of this innovative urban farmer training. 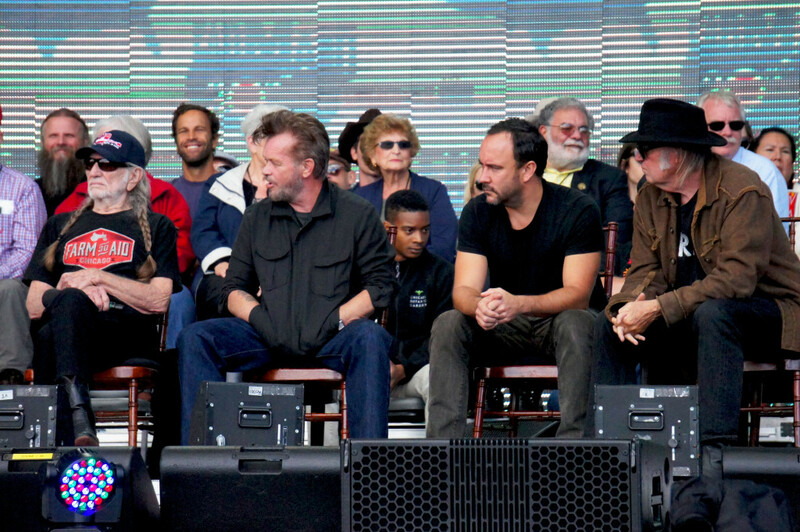 At Farm Aid 30, Darius took the stage for the press event that kicked off the day with Willie Nelson, John Mellencamp, Neil Young, Dave Matthews and young and old farmers, advocates and activists. He shone bright, cracking up the audience and his fellow speakers with his humor. This city kid, growing food in the concrete jungle of Chicago, embraced the rural, farmer old-timers as if he’d known them all his life. The miles and years and differences between them were obliterated, as farmer met farmer on common (fertile!) ground. And nobody was surprised when Darius made Rolling Stone‘s “15 Best Things We Saw at Farm Aid 30” article! This rockstar farmer is certainly heading for even higher heights! This entry was posted in Family Farms, Farm Aid, Farm Aid concert, Farmer training, Food Entrepreneurs, Good Food Festivals, Good Food Photos, Good Food Success Stories, Local Food, Rooftop growing, Small Farmers, Sustainable meetings, Urban farming, Young farmers and tagged Chicago Botanic Garden, Darius Jones, FamilyFarmed, Farm Aid, Farm Aid 30 in Chicago, Farmer Heroes, McCormick Place, McCormick Place rooftop farm, rooftop farming, SAVOR...Chicago at McCormick Place, Urban agriculture, Urban farming, Windy City Harvest. Bookmark the permalink.